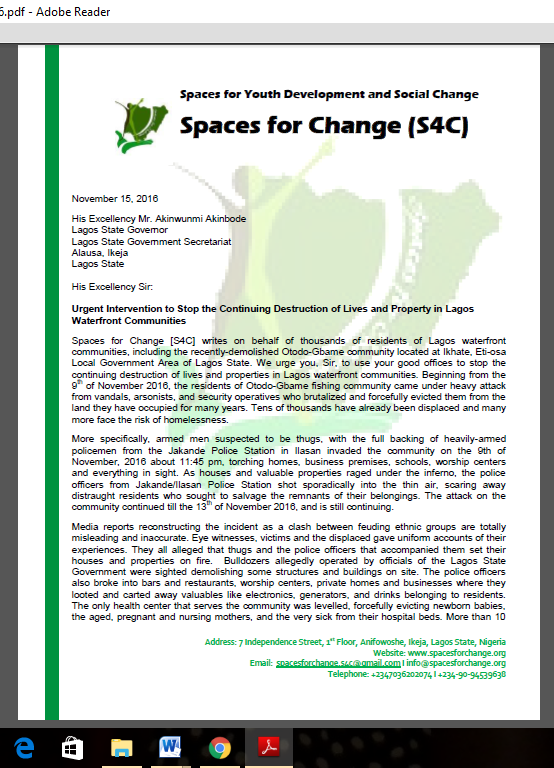 Spaces for Change [S4C] writes on behalf of thousands of residents of Lagos waterfront communities, including the recently-demolished Otodo-Gbame community located at Ikhate, Eti-osa Local Government Area of Lagos State. 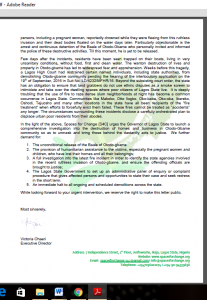 We urge you, Sir, to use your good offices to stop the continuing destruction of lives and properties in Lagos waterfront communities. Beginning from the 9th of November 2016, the residents of Otodo-Gbame fishing community came under heavy attack from vandals, arsonists, and security operatives who brutalized and forcefully evicted them from the land they have occupied for many years. Tens of thousands have already been displaced and many more face the risk of homelessness. More specifically, armed men suspected to be thugs, with the full backing of heavily-armed policemen from the Jakande Police Station in Ilasan invaded the community on the 9th of November, 2016 about 11:45 pm, torching homes, business premises, schools, worship centers and everything in sight. As houses and valuable properties raged under the inferno, the police officers from Jakande/Ilasan Police Station shot sporadically into the thin air, scaring away distraught residents who sought to salvage the remnants of their belongings. The attack on the community continued till the 13th of November 2016, and is still continuing. Media reports reconstructing the incident as a clash between feuding ethnic groups are totally misleading and inaccurate. Eye witnesses, victims and the displaced gave uniform accounts of their experiences. They all alleged that thugs and the police officers that accompanied them set their houses and properties on fire. Bulldozers allegedly operated by officials of the Lagos State Government were sighted demolishing some structures and buildings on site. The police officers also broke into bars and restaurants, worship centers, private homes and businesses where they looted and carted away valuables like electronics, generators, and drinks belonging to residents. The only health center that serves the community was levelled, forcefully evicting newborn babies, the aged, pregnant and nursing mothers, and the very sick from their hospital beds. More than 10 persons, including a pregnant woman, reportedly drowned while they were fleeing from this ruthless invasion and their dead bodies floated on the water days later. Particularly objectionable is the arrest and continuous detention of the Baale of Otodo-Gbame who personally invited and informed the police of these destructive activities. Till this moment, he is yet to be released. Few days after the incidents, residents have been seen trapped on their boats, living in very unsanitary conditions, without food, first and clean water. The wanton destruction of lives and property in Otodo-gbame has led to widespread fear and apprehension. Weeks before this tragedy, a Lagos High Court had restrained certain named individuals, including state authorities, from demolishing Otodo-gbame community pending the hearing of the interlocutory application on the 19th of September, 2016 in Suit No. LD/4232/MFHR/16. 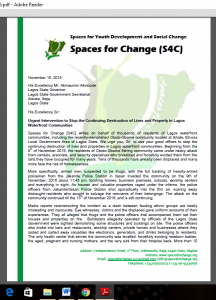 Beyond the subsisting court order, the state has an obligation to ensure that land grabbers do not use ethnic disputes as a smoke screen to intimidate and take over the dwelling spaces where poor citizens of Lagos State live. It is deeply troubling that the use of fire to raze dense slum neighborhoods at night has become a common occurrence in Lagos State. 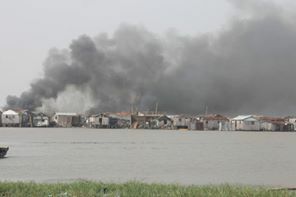 Communities like Makoko, Otto Ilogbo, Oko-baba, Oko-oba, Ibereko, Oshodi, Tejuosho and many other locations in the state have all been recipients of the “fire treatment” when efforts to forcefully evict them failed. These fires cannot be treated as “accidents” any longer. The circumstances surrounding these incidents disclose a carefully orchestrated plan to displace urban poor residents from their abodes. The Lagos State Government to set up an administrative panel of enquiry or complaint procedure that gives affected persons and opportunities to state their case and seek redress in the short term. An immediate halt to all ongoing and scheduled demolitions across the state. 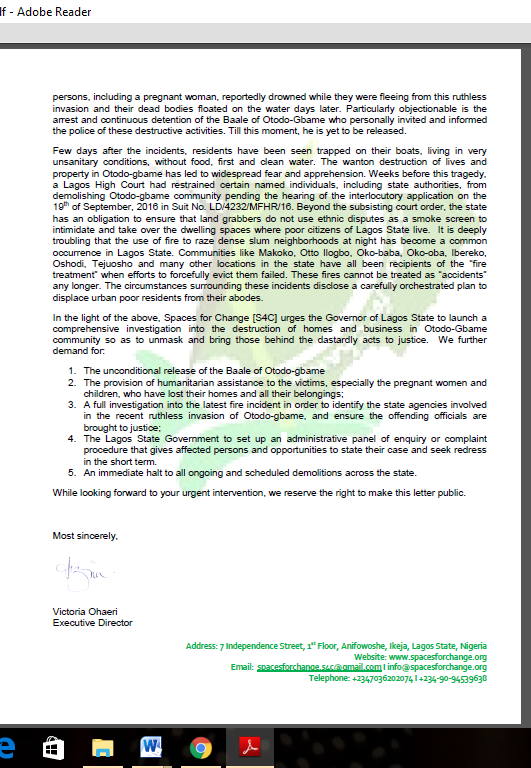 While looking forward to your urgent intervention, we reserve the right to make this letter public.